Brighton & Hove Albion manager Chris Hughton says he "could not have envisaged" his side being four points clear at the top of the Championship at this point of the season. The Seagulls, who finished two places above the relegation zone last term, beat Hull 1-0 at home on Saturday. "We wanted to be in a position where we could at least challenge to go up. That is still the case," said Hughton. "We've made a tremendous start and I could not have envisaged it." Hughton's side are unbeaten so far in the Championship this campaign, and earned their fifth win in six league games thanks to Israel international Tomer Hemed's third goal in two games. "I was hopeful we could challenge better," said former Norwich manager Hughton. "At the moment the margins are going our way. "Just now we have fit players and good options, and we have continued the momentum following the international break." Before kick-off at the Amex Stadium, both sides paid tribute to the 11 victims of the Shoreham air disaster. Matt Grimstone, a member of Brighton's ground staff, and Seagulls supporter Jacob Schilt were among those who died when a Hunter Hawker jet crashed on to the A27 on 22 August. "A tribute can go two ways. 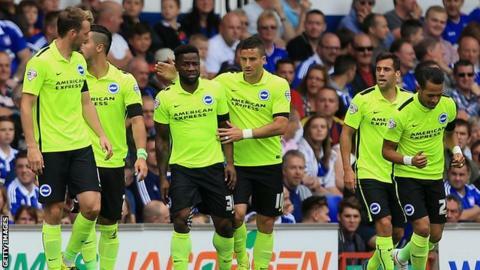 It can draw you on and motivate you, and the way we started I would like to think that it inspired the players," said Hughton. "It was a fitting tribute by the club and it was a fitting day; in particular for the two lads (Matt Grimstone and Jacob Schilt)."